Capsule Summary: After the 4077th receives a 90% efficiency rating, Henry is assigned to a hospital in Tokyo, leaving Frank in charge. Hawkeye, Trapper, and others conspire to get Henry back. There may not be another episode of M*A*S*H quite as unbelievable as “Henry, Please Come Home.” It makes absolutely no sense whatsoever that Henry would agree to leave his comfy position in Tokyo to return to the 4077th. It’s just not believable. I can accept that he might be worried enough about Radar to make a trip back to the 4077th but to stay permanently? As viewers and fans, we like to think of the 4077th as a family with Henry (and later Colonel Potter) as the father figure. In real life, however, why would someone like Henry, who was drafted and sent to South Korea, give up a safe, comfortable posting in Tokyo to return to the front? True, he told Hawkeye and Trapper he’d miss them, and he clearly cared for Radar, but would that really be enough? Also, Hawkeye and Trapper and everyone else back at the 4077th were being very selfish. They weren’t necessarily trying to get Henry back because they liked and appreciated and respected him. They really just wanted to make sure Frank wasn’t in command. Frank gets his first, brief taste of command and its more than enough to send Hawkeye, Trapper, Radar, and the others scrambling to find a way to get him out of command. It’s too bad Margaret isn’t in this episode; we don’t get to see her reaction to Frank in charge of the 4077th for the first time. The M.P. pulling a pistol on Hawkeye, Trapper, and Spearchucker in the Swamp was unnecessarily dramatic. I’d like to think an actual member of the military police would refuse to pull a weapon on some doctors even if one of them is holding a flyswatter. 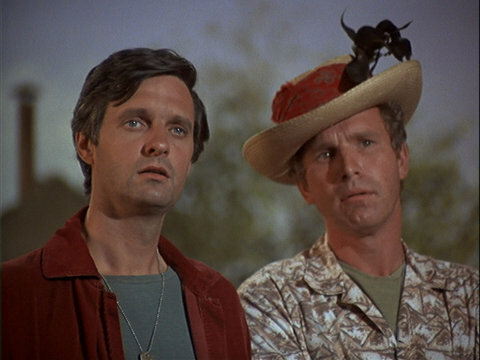 Hawkeye and Trapper learn that Henry is leaving the 4077th. “Henry, Please Come Home” was the second episode of M*A*S*H to be produced and its obvious the show was still finding its footing. Hawkeye is seen wearing his hat, for one thing, and the number of supporting characters is almost overwhelming: General Hammond, Ho-Jon, Spearchucker, Ugly John, Boone, Leslie, and Ginger. To be honest, I like all these characters and how they make the 4077th really feel like a military outpost with all sorts of characters. But I understand why most of them were phased out by the middle of Season 1. William Christopher makes his first appearance as Father Mulchahy in this episode. Radar is seen reading a Captain Savage and His Battlefield Raiders issue that wasn’t published until 1969. Is it just me or does Radar’s patchy 5 o’clock shadow look more like dirt than facial hair? Margaret is not in this episode. I like this episode myself. I’ll agree that it’s not entirely believable, but I find it otherwise enjoyable to watch because of how you can tell that this was produced and filmed very early on in the season: the still in the Swamp still doesn’t have the usual design we’re used to seeing with the big glass globe. One thing that recently crossed my mind is . 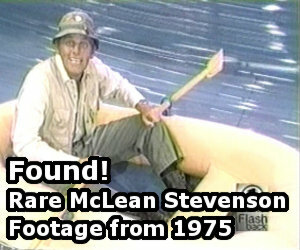 . . how did Hawkeye and Trapper actually get into the tub with Henry? They say they just “swam through,” but I mean, did they just sit underwater, waiting for Henry and Cho Cho to get in? Wouldn’t they have drowned? It also looks to me that Hawkeye’s jaw is swolen when he’s fessing up to Henry about their scheme. I always wondered this same thing. We see the hot tub for a good few seconds before Henry gets in, then the two of them just pop up. Henry doesn’t act surprised at all. Did they sneak in and try to surprise him, or did he know they were there already and they were just messing around? This is one of my favorite early episodes of season 1. Leslie gets the most screen time/lines of all her few appearances. I also like this episode, and I disagree with it being unbelievable that Henry would want to return to the 4077th. I think it’s believable. It’s strange that Margaret’s absence was never mentioned in this episode by any character. I wonder why they didn’t refer to her not being there in any way. IMO, I thought Frank was especially heartless toward Radar. I was just watching this episode. Anyone else struck by the thought that had Hawkeye and Trapper not intervened, and Henry remained in Tokyo, then his discharge situation would have been at least slightly different, and he never would have been killed? Way to go, guys! Wait, Henry got killed? How come nobody warned me! Seriously, you make an excellent point, which gives this episode unintended poignancy, watching Henry luxuriating for what will be for him the only time in a post-war existence. Not Hawkeye and Trapper’s fault, but if the show did that kind of continuity and Trapper stayed on to Season 4, it might have made for an interesting discussion in the Swamp. I wonder if the writer had Henry say “How’s things back at the ranch “as an in-joke referring to the Fox Ranch. Were the first few seasons of MASH believable? I find it unlikely that Henry leads the unit to such a high rating that he is transferred to Tokyo in the first place. Ostensibly to manage a larger scale medical operation, but he says he gives his 3 lectures then his time is his own. He takes baths, get massages, and drinks. Henry is almost always shown as a relatively good doctor & surgeon, but a bumbling officer, constantly in need of Radar’s skills as an organizer to make the 4077th run well. All of the plot basics serve as a vehicle for jokes and sight gags. The plot progression doesn’t need to make perfect sense. Don’t get me wrong, I love MASH and have watched it from the beginning in 1972. They showed this episode on ME TV last night — I had forgotten the gorgeous brunette nurse that appears in this episode (Hawkeye attempts to hug her as she walks towards the post op building). Is it possible she is the same brunette running in the opening credits?